How to get on the first page of Google. To get on the first page of Google you have to write, publish, and distribute articles about your brands, products, services, and how they satisfy your customers and prospects needs, in a permanent manner, at least 100 articles per year. Before you begin to write the articles, you have to setup, design, develop, and launch your owned media channels: WordPress responsive website; WordPress responsive Blog; social networks profiles, business pages, and groups pages; guest blogs; directory listings; business associations listings; email marketing platform. You have to comply with NAP consistency, meaning that your Business NAME, ADDRESS, and PHONE (NAP), must be the same in all your owned media channels, from URL domain name to social networks, guest blogs, directory listings, business association listings, and Google marketing products. Before you write the articles, you have to setup, design, develop, and launch the main Google marketing products: Gmail, Search Console, Analytics, My Business, MAPS. You have to approve the Google website performance tests; and you have to comply with the Google Webmaster Guidelines. You also have to comply with few technicalities, such as URL domain name security (https://), and website security with SSL certificates. Your website needs a site map, and your Blog needs a SEO plugin, and the Google Tag Manager plugin. Once you built your owned media channels; once you launch and comply with all the Google products, tests and guidelines; and once you setup all the URL and Website technicalities; then you are ready to do the key phrase analysis (KA), using the Google Keyword Planner, to determine which search terms are using your prospects and customers, to search for your products and services. With these terms, you can begin to write the articles, to position these search terms on the first page of Google search results. Each article must have a relevant image, related to the content topic. 2 or 3 times within the article content, with a link to another of your articles written about the same topic. We call all this strategy: article marketing campaign. You will position your brands, business, products, and services, on the first page of Google search results; and also you will position them on the social networks and email marketing. You need to write in a permanent manner, all the knowhow about your products and services, and how they satisfy your customers and prospects needs. Write articles about your products and services, and how they satisfy your customers and prospects needs. Distribute these articles in all your owned media channels: social networks personal profiles, business pages, and group pages; guest blog pages; and email marketing. Write, publish, and distribute articles in a permanent manner and you will conquer the first page of Google and the social network and email marketing. This article was written on March 28, 2019. This article, and all our previous articles, are originally published at our WordPress Blog at http://www.msalesleads.com/category/articles/ , and then they are distributed in the Google search console; in all our social network pages and groups; in all our third party platform blogs; and in our email marketing platform. This article was written by Julio R. Sanoja, owner and founder at MSalesLeads, a digital marketing agency for small and mid-size businesses in Miami, Florida. We help small and mid-size businesses to go and grow their businesses online; position their brands, products and services online; and get qualified leads and new customers online. We have been doing this for the last 17 years. 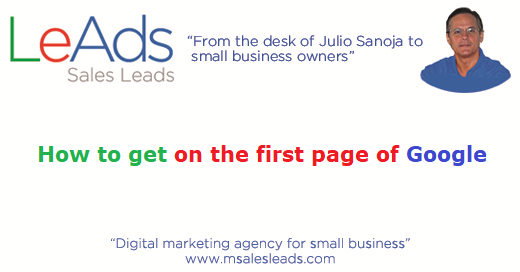 You can write me juliosanoja@msalesleads.com or you can call me 305-918-9793. Julio R. Sanoja is also a consultant, strategist, and speaker about Google and the first page of Google, and about digital marketing and digital advertising. 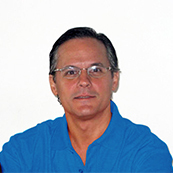 Julio offers online and in company Google SEO and first page of Google conferences, training, courses, and workshops.